Radiothon: 4-year-old Camila Lopez isn’t letting cancer slow her down | Norton Children's Louisville, Ky.
Three-year-old Camila Lopez climbs out of her hospital bed and makes her way to a bench. Her beautiful, long brown hair dangles down her back, swaying with every curious head turn. The chemotherapy that is fighting her leukemia also is slowly robbing her of her hair. In November, just as many families were preparing for the holidays, the Lopez family was growing more and more concerned. Camila wasn’t herself. Instead of playing, she wanted to lie in bed. She spent many nights crying. Several trips to after-hours retail health care centers followed. She was diagnosed with strep throat, then an ear infection, then a cold. Tina decided it was time to take Camila to her pediatrician, who ran some tests. After a series of tests, Tina and her husband, Armando, received the worst news of their lives — their daughter had leukemia. Their world was turned upside down. The Lopezes hope that by sharing their story, they might help save a life. Following her diagnosis, Camila received three blood transfusions and three platelet transfusions. She’s endured several rounds of chemotherapy. Fighting cancer is a complex battle. 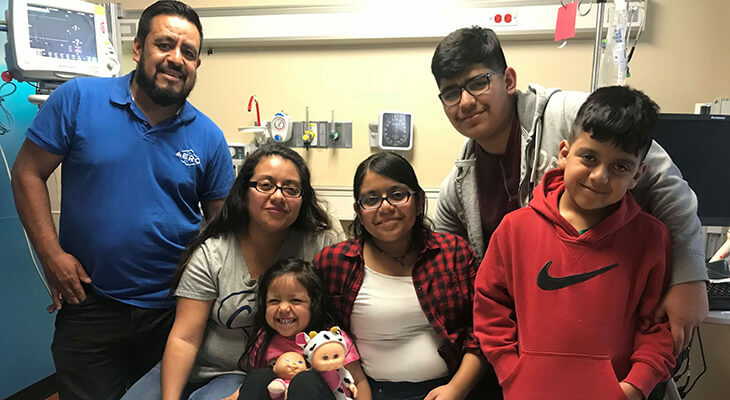 With their extended family living in Mexico and Texas, Armando and Tina are doing their best to keep it all together and stay strong, not only for Camila, but also for their other children — all while managing work and school schedules. “Your world crashes because of one, but there’s still three other kids that we have to take care of — figure out how to get them home, feed them, baths, homework and get back to the hospital for Camila,” Tina said. On top of keeping basic needs in order, they struggled with how they were going to break the news to Camila’s siblings. Therapists at Norton Children’s Cancer Institute, affiliated with the University of Louisville, helped them come up with a plan and offered therapy services to work through the emotional pain. Norton Children’s Cancer Institute offers a number of services that go beyond treatment, such as art and music therapy to help kids cope and parties to celebrate the end of chemotherapy. “Camila loves music therapy,” Tina said. “Camila is already doing so much better and the nurses are wonderful — we know almost all of them, and they’ve become like family,” Tina said.